Hi Traders. I need your help!!! I can help you too. I trade about 2 years. During that time I observed (on real accounts) that some brokers are jamming from time to time. Those significant differences happen! They last seconds or fractions of seconds, even many times a day. I am not as fast as computer to catch them, so decided to write software to do it automatically. When finished my program I started test. I expected amazing results but was still surprised. to 2 lots, still perfect. Twenty four profitable trades. STOP !!! Man do some losing trades! Ok. Opened and closed manually three loosing trades each 0.10 Lot only. And now again, lets try three lots this time. Winner, BE, winner, winner. Those all wins were : around 1 pip to ~ 3.5 pips. Unfortunately I probably had too much wining trades and my broker saw it in his statistics. They did not want make a "big deal", I can now trade again without their employee assistance but under condition- not to use their system "weakness". but price you will open order (MT4) doesn't have to be what you saw on your screen) please let me know which one is it. I will try to test the broker. If with positive results then I can share my soft as acknowledgements. Do you imagine how hard is to observe only, jamming broker(instead of push AutoTrading Button) when you know what will happen in a second? It's like knowing lotto numbers but you can't play. Profitable trades for you !!! Sorry but had to one up you. 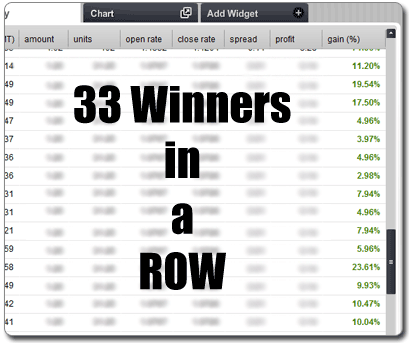 The trader I am following MagicMan34 just had 33 winning trades in row. Have a look at the results below. I follow someone who had 33 winners in a row. Sorry to one up you. The results are pretty good, they are fairly low risk trades. Thanks guys. But question is - do you have real accounts with mentioned brokers and have you observed any "delays" on real accounts?